Perhaps because dying in a slasher movie was new territory for him, Henry Winkler revealed that his death scream was at first inefficient. 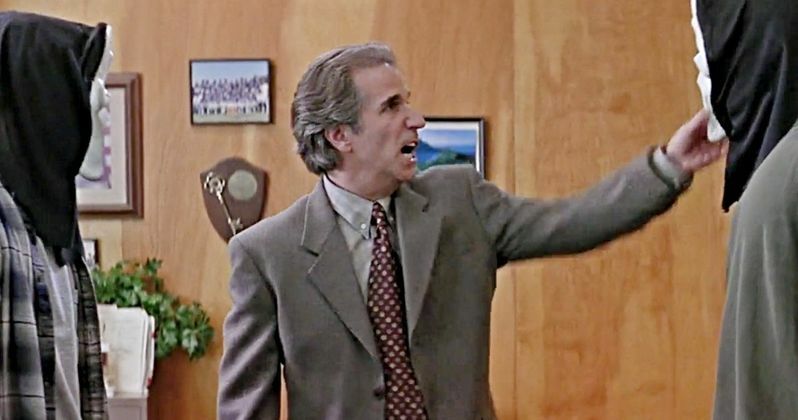 After some direct coaching from director Wes Craven, however, Winkler got further into the character and totally nailed the principal's demise. "This one shot, with the bad guy with the mask coming into my eyeball, it took two hours to shoot. As he was stabbing me, Wes, in his professorial way, came up and he said, 'Do you think it might be more excruciating? Do you think being stabbed you would scream a little louder?' I said I could do that. Then, because I had tubes going up my clothes, coming out my shirt, out of my chest, they filled it back up [with fake blood], and then I screamed much louder." In the scene, Winkler is alone in the school after hours, suspending classes in the wake of the murders in Woodsboro. He is attacked in his office by an unknown assailant wearing all black with a Ghostface mask. The murderer brutally stabs the principal to death, making him one of the very first victims of the horror movie series. Dialogue in the movie later confirms that the killer had displayed Himbry's gutted body on a goalpost on the school's football field. It's a small part, and yet it remains one of the more memorable death scenes across all four Scream movies. Scream 4 was the last installment of the franchise and director Wes Craven's final movie. The filmmaker's passing in 2015 ended all potential sequel plans for the series, leading to a TV series reboot for MTV. It seems very unlikely there will ever be a Scream 5 to continue the story of Sidney Prescott, as Craven's absence creates a tremendous void. Of course, it remains possible the franchise could be rebooted for the big screen as well, resetting the story once again. Winkler first rose to fame back in the '80s as one of the stars of the comedy series Happy Days. A stark contrast to the school authority figure he played in Scream, Winkler's character Arthur "The Fonz" Fonzarelli was a leather jacket wearing rebel. Despite being a bad boy, however, the Fonz was undoubtedly cool. Defying the greaser stereotype, Fonzie was just as kind and supportive to others as he was tough, making him one of the most beloved characters from sitcom history.